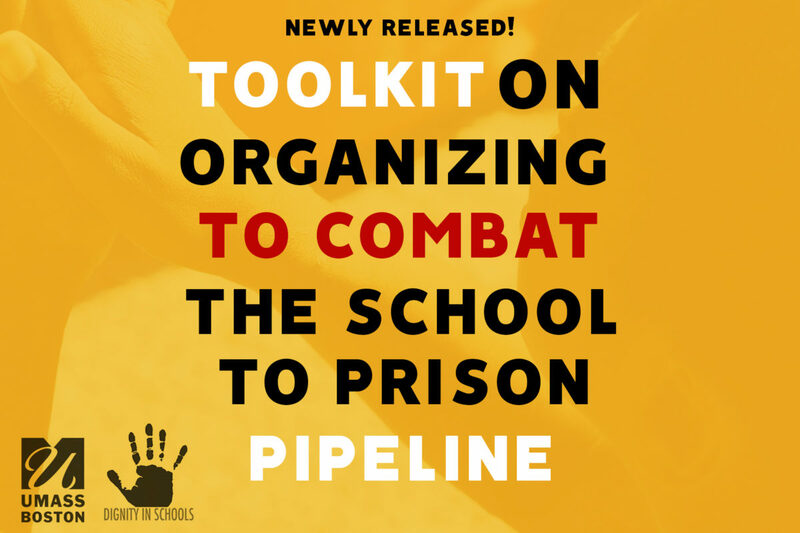 Toolkit on Organizing to Combat The School-to-Prison Pipeline Out Now! New York, NY and Boston, MA – The Dignity in Schools Campaign and Professor Mark Warren at the University of Massachusetts Boston are excited to announce the release of a new online toolkit, “Organizing to Combat the School-to-Prison-Pipeline.” This toolkit, developed with support from the W.K. Kellogg Foundation contains over 130 resources produced by students, parents, advocates and organizations, each created to assist new, and more established community groups, with their organizing efforts against the school-to-prison pipeline in their local communities. In this climate of ongoing and resurgent institutional discrimination and criminalization, the movement to end the school-to-prison pipeline is at a critical juncture. This toolkit includes resources to assist groups to: build a base of parent, youth and community participants, develop leadership from those most affected by school pushout, conduct participatory action research, educate members about how the school-to-prison pipeline operates, develop campaign strategies for policy change, and create positive and restorative alternatives to punitive school discipline practices. The toolkit is located on the Dignity in Schools website (www.dignityinschools.org/toolkits/stpp) with resources available for access and download at no cost to users. “We at the University of Massachusetts Boston are excited to support the building of the movement to end the school-to-prison pipeline by providing needed resources to parents, young people and their allies who are leading change efforts at local, state and national levels. We are proud that our urban public university can play a role in advancing racial justice in our schools and communities.” Mark R. Warren, Professor of Public Policy & Public Affairs, University of Massachusetts Boston.